Happy spring! Although it’s still pretty cold here in New York and it actually snowed yesterday, winter is finally behind us. I’m so ready for warmer weather, breaking out the grill, and getting our vegetable and herb garden going. Asheley is really excited that she can finally start using the bike she got for Christmas. Her new obsession is wanting to compete in triathlons (yea, I know… I don’t get it either). If you can remember way back to the beginning of January, I told you about how Asheley and I were doing this sort of food cleanse. Well the cleanse and its effects are long gone, but the spaghetti squash that was frequently consumed during those ten days stuck with us. Both the Roasted Spaghetti Squash with Red Pepper – Tomato Sauce and Spaghetti Squash with Roasted Broccoli and Parmesan have made occasional appearances since then on our dinner plates. But then my good friend Steve and I went to this little, local Thai restaurant this past weekend and that got me thinking. Pad Thai. Spaghetti Squash. Pad Thai. Spagh…. 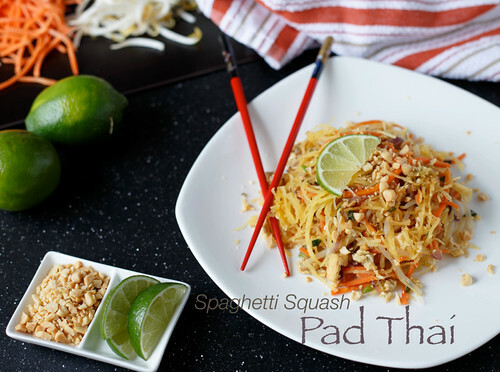 what if I can make Spaghetti Squash Pad Thai?! In full disclosure, my first attempt didn’t go so well. The sauce was weird. And I added the cooked spaghetti squash into the pan with the rest of the Pad Thai mixture too early, making it a big bowl of mush by the time the rest of the dish was done cooking. After some much needed tweaking, culinary victory was mine. Spaghetti squash makes such a great, healthy substitute for dishes where regular pasta or other noodles are called for. Just slice one open (easier said than done, since it does have a thick skin… make sure your knife is sharp! ), scoop out the seeds and guts, brush with some oil and season with salt and pepper, and roast in the oven for about 45-60 minutes. Then comes the fun part: shred the flesh using a fork, creating beautiful long strands. I should have had the red onion and garlic in this picture also. I forgot. And now it’s too late, so I hope you didn’t notice. But then I told you about it, so now you probably noticed. Everything you need for the sauce should be readily available in your normal grocery store. Fish sauce and rice vinegar are easy finds, and tamarind nectar should be by all the Goya products. If you don’t have rice vinegar, I’ve heard that you can substitute regular distilled vinegar (although I haven’t tried it). If you have Thai chiles around, feel free to use them instead of red pepper flakes. I did not. Definitely do not, under any circumstance, forget the wedges of lime and chopped peanuts. I know garnishes don’t always scream “essential”, but in this case I think they are. Asheley doesn’t have many faults. That’s why I married her. But she does, unfortunately, have one that still shocks me to this day. She’s not a huge fan of Thai food. Yet. I’m working on it. Spaghetti squash for spaghetti is one of my favorite recipes! 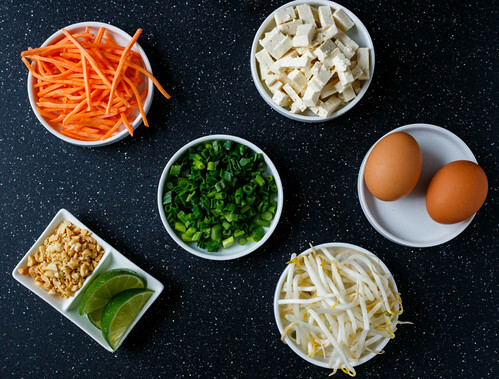 I love pad thai so I might have to give this a shot! Great work. 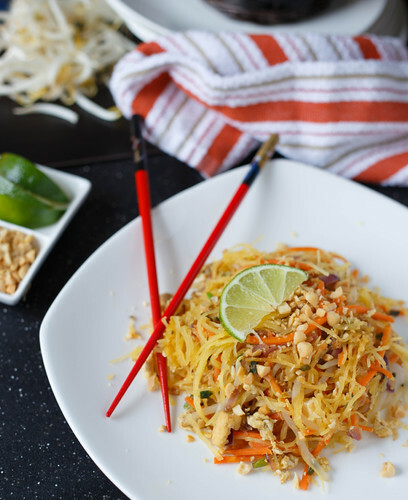 I’ve done Italian with spaghetti squash but never thought of Pad Thai. What a great idea! I also completely agree that the garnish is an essential part of this dish. Italian is my go to with spaghetti squash also. This was a nice change and now actually might be my favorite way to enjoy spaghetti squash. You are totally right, I completely didn’t even think of that. Good catch 🙂 I googled “vegetarian fish sauce” and there definitely are some substitutes out there, even pre-made ones. I’d love to send some sunshine your way – here in CA we’ve had the driest winter on record…it’s been in the 60s and 70s and blue for a solid month! 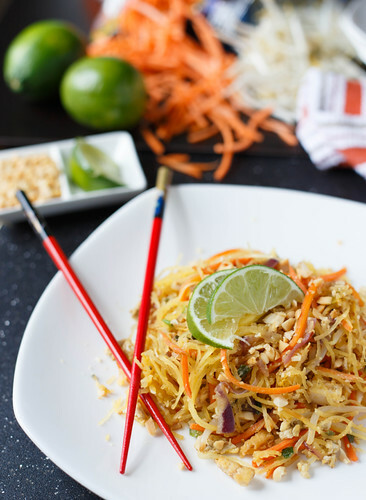 Pad Thai has been one of my faves since I was a teenager, and I love that you use spaghetti squash in place of noodles. I love trying to keep meals as clean as possible and this recipe looks perfect for me! Go ahead, rub it in, rub it in! It’s finally starting to warm up here 🙂 So glad you like the recipe. Let me know how it turns out. And my wife and I are traveling to CA for vacation this summer. Keep the weather good for us! This looks absolutely amazing! I can’t wait to give it a try! What an inventive use of the squash. Definitely a great looking dish, thanks for sharing! I have tamarind paste, any suggestions on how much of that I should use? Thanks! Hi Sapna, great question. 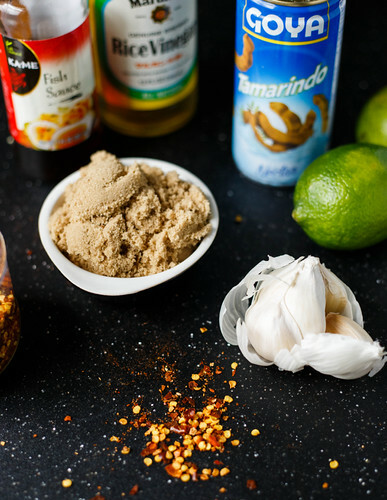 I actually couldn’t find tamarind paste by me, which is why I used tamarind nectar… I was able to find it in all the local grocery stores, so I figured it was more readily available. I never have used tamarind paste, but from what I’ve been reading, it is definitely more potent than the nectar. Apparently different brands of tamarind paste are stronger than others. Many other sites suggest diluting paste with a little water, so I would try using around 1/2 tbl. paste combined with 2 tbl. very warm water. Wow Lee, thank you so much for the incredible compliment! I’m so glad you liked it! 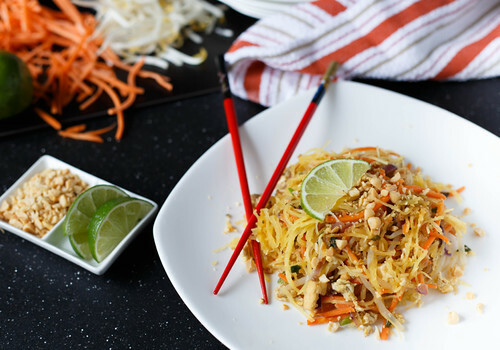 Hi Chris – I made the Pad Thai for supper last night, and my husband and I both thought that it was really delicious! He said that it was restaurant quality 🙂 We’re not eating meat at home, and I’m always looking for interesting non-meat recipes, and this one is definitely a keeper! I also added chopped coriander/cilantro. I used tamarind paste, probably less than a teaspoon, as it is concentrated, and using too much would make the sauce too sour. Thanks again for the great recipe! I made this for dinner awhile back and it was SO GOOD! 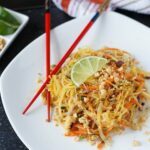 I love using spaghetti squash for noodles, but wouldn’t have thought of using them for Pad Thai. So yum! WOW. Just wow. My new favorite dish! 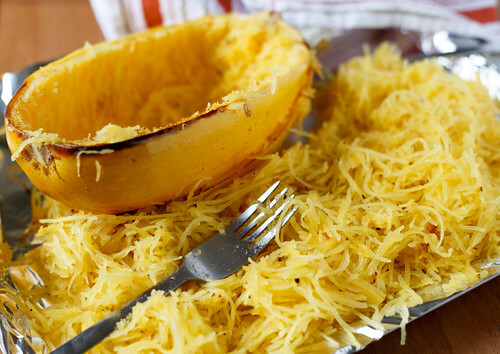 I didn’t even notice I was eating spaghetti squash – I think I could eat this every night! 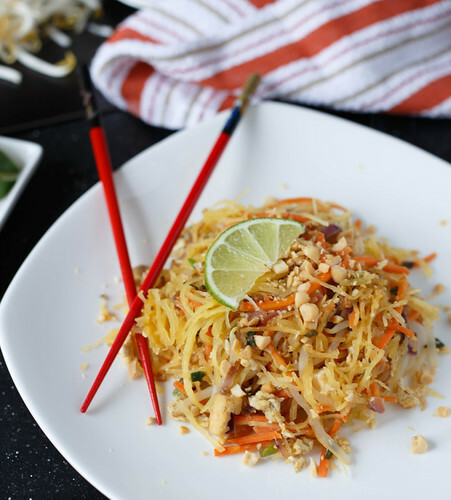 I love Pad Thai and you can’t get your veggie serving any better way! Next time I’m making lots – I’m assuming it would reheat fine for work week lunches! I added cilantro and did egg whites to make it healthier – this recipe is ROCKIN! THANK YOU! !